We’d love your help. 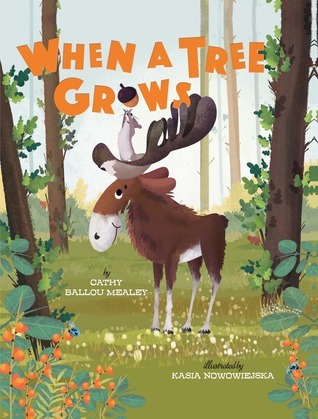 Let us know what’s wrong with this preview of When a Tree Grows by Cathy Ballou Mealey. 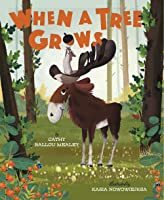 WHEN A TREE GROWS follows a wacky chain of events when a squirrel's nut obsession takes him far from the forest and his klutzy friend, Moose. To ask other readers questions about When a Tree Grows, please sign up. When a Tree Grows is a clever story that continuously gives readers a peek at one thing that could happen before taking a sharp turn in a more interesting direction. The woodland characters are cute, the novel storytelling technique is engaging, and the plot twists are...nuts. This book is ingenious and fun! Employing two possible outcomes - one plain and expected and one funny and extreme - for each action that occurs, Cathy and Kasia draw the reader through the text in anticipation of what happens next. The curled paper edge illustration is such a fun way to tantalize the reader. Is a tree a scratching post or a horrible wake-up call for a bear? When Bear wakes, does he roll over or charge outside into Moose? Following the antics of Moose, Bear, and Squirrel, the st This book is ingenious and fun! Employing two possible outcomes - one plain and expected and one funny and extreme - for each action that occurs, Cathy and Kasia draw the reader through the text in anticipation of what happens next. The curled paper edge illustration is such a fun way to tantalize the reader. Is a tree a scratching post or a horrible wake-up call for a bear? When Bear wakes, does he roll over or charge outside into Moose? Following the antics of Moose, Bear, and Squirrel, the story weaves through the forest and into the city. Where squirrel becomes an action hero OR . . .